Growth in the global LED display market accelerated strongly in 2017, to reach a sales value of $5.3 billion. The Americas region reached a key milestone in its development, surpassing $1 billion for the first time, according to a new report issued by market research firm Futuresource Consulting. 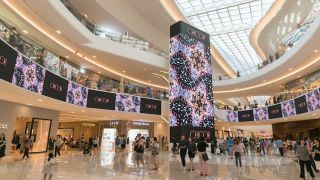 The LED display industry is riding on the crest of an exciting wave of technological innovation, with kaleidoscopic channel and competitive dynamics. This latest Futuresource report provides strategic supply chain intelligence by covering the full range of LED display options as well as technological, competitive and channel related forces that have not only played an important role in today’s LED market place, but also shows what one can expect over the coming years. In this report, Futuresource has ranked and categorised vendors into distinct groups based on their strengths including brand awareness, product portfolio, and how they behave in this quickly evolving market. Futuresource states that most vendors enjoyed growth in 2017 but with varying degrees of success. There are a myriad of factors dictating the degree of success across the competitive landscape, but for those few that have been particularly impressive, the capacity and pressure to fulfill large production seems to underpin their momentum. The LED market has also witnessed strong merger and acquisition activity in recent years, with display vendors looking to access new technologies, increase their geographical footprint or diversify their customer bases. Futuresource expects to see this activity continue in the coming years as the market matures. “An area to watch will be the new entrants launching LED products, typically coming from other areas of the visual display market. Indeed, it is increasingly rare to find a professional display vendor without LED in its range – although there are still a number of heavyweights in adjacent display areas yet to enter,” added McIntyre-Brown. Futuresource also expects service, support and localization to become more important with established international display brands expected to grow in stature.